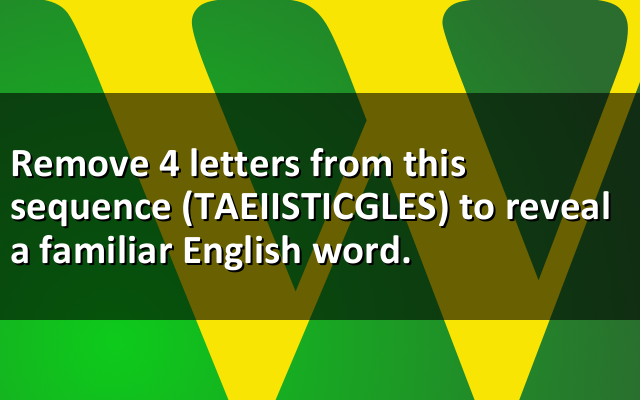 Remove 4 letters from this sequence (TAEIISTICGLES) to reveal a familiar English word. The first user who solved this task is Manguexa Wagle. Mom was trying to get her son to get out of bed and get ready for school. "I am not going to school!" the son responded defiantly. "Why not?" Mom wanted to know. "Well, first of all I hate school and second of all ..the kid all hate me!!" was the answer. "Son, that's not good reasons..you will have to get up and ready for school!" Mom replied. "Well, give me two good reasons why I should," the son said. "Well," Mom said quietly, "First of all you are 52 years old and second of all...You are the Principal." Born 22 Apr 1724; died 12 Feb 1804 at age 79. German philosopher, trained as a mathematician and physicist, who published his General History of Nature and theory of the Heavens in 1755. This physical view of the universe contained three anticipations of importance to astronomers. 1) He made the nebula hypothesis ahead of Laplace. 2) He described the Milky Way as a lens-shaped collection of stars that represented only one of many "island universes," later shown by Herschel. 3) He suggested that friction from tides slowed the rotation of the earth, which was confirmed a century later. In 1770 he became a professor of mathematics, but turned to metaphysics and logic in 1797, the field in which he is best known.